After finding out about having Twins around 13 weeks my wife was having a pretty normal pregnancy. At 24 weeks during another routine ultrasound the tech went looking for the membrane that separates normal twins and could not find it. They promptly scheduled us with the high-risk group at the hospital. 2 Ultrasound Techs and 2 doctors scanned my wife and did not see that membrane. We spent nearly 6 hours that day at the hospital, learning about mono-mono twins. There was talk of mortality, cord entanglement and other issues. We than developed a plan of action. The doctors suggested admitting my wife at 25 weeks, that day for twice a day monitoring. After some discussion with the doctor we decided to try it out patient. We visited the hospital twice a day for nearly 8 weeks after that. Once in the morning, and once at night. Depending on the positions of our ever shifting mono-mono twins it was difficult to keep the on the Fetal Heart Rate monitor, however we stuck with it every time until we had a good 20-30 minute strip of them both at the same time. At 31 and 4 days my wife was finally admitted to the hospital because of some variables they saw on the monitoring. Over the next few hours however things stayed ok. We decided to stay in the hospital anyway since the plan was to be admitted around 32 weeks, so just a couple days before. After 2 more weeks of monitoring, a scheduled C-Section on 11/11/2009 our twin girls were born. 4 lbs 5 oz and 4 lbs 9 oz. They are currently in NICU and doing very well. This experience has been a roller coaster for both of us. We strongly recommend doing everything you can for your mono-mono twins. We like to say we became full time parents back on 9/11/2009 before the girls were even born. We spent nearly 4-6 hours a day making sure they were ok.
Well its now the end of November and both the girls are already home! 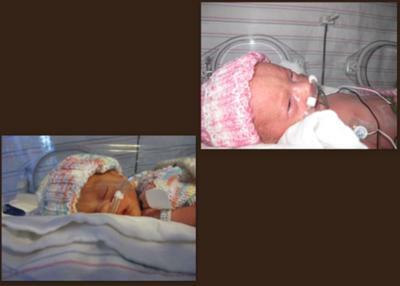 They spent 9 and 12 days in the NICU. Katie S: Email me at da@mbwit.com and I can fill you in with more details. Stay strong, it will be scary but there are great outcomes to Mono-Mono twins.